Liam Skelly, Michael Guerin and Niall Moloney viewing the Shannon Airport photographic exhibition. 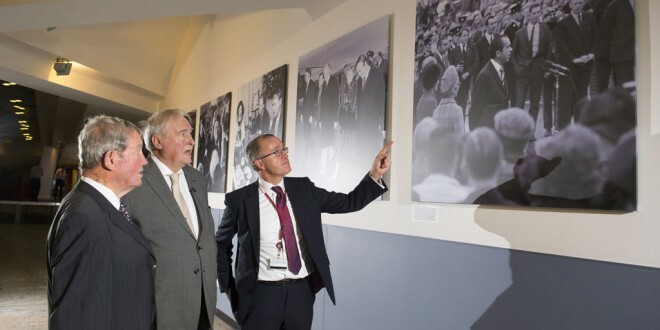 A PHOTOGRAPHIC exhibition capturing some of the golden moments and world famous faces that visited Shannon Airport has just opened. Closing the curtain on a year of celebrations to mark the 70th anniversary of the first commercial transatlantic flight into Shannon, or any land-based Irish airport, some 64 images, dating from the 1950s up to now, have been placed in a permanent exhibition on the walls of the airport’s transit lounge. The exhibition, which was officially launched by Shannon Group chairman Rose Hynes, reflects the international standing of Shannon as a global aviation crossroads as it includes some of the world’s best known personalities of politics, stage, screen and sport. Famous faces and events captured in the exhibition include every US president from presidents John F Kennedy to Barack Obama; other global political and religious leaders such as Nelson Mandela, President Mikhail Gorbachev, Chinese President Xi Jinping, Cuban President Fidel Castrol, Pope John Paul II and the Dali Lama.